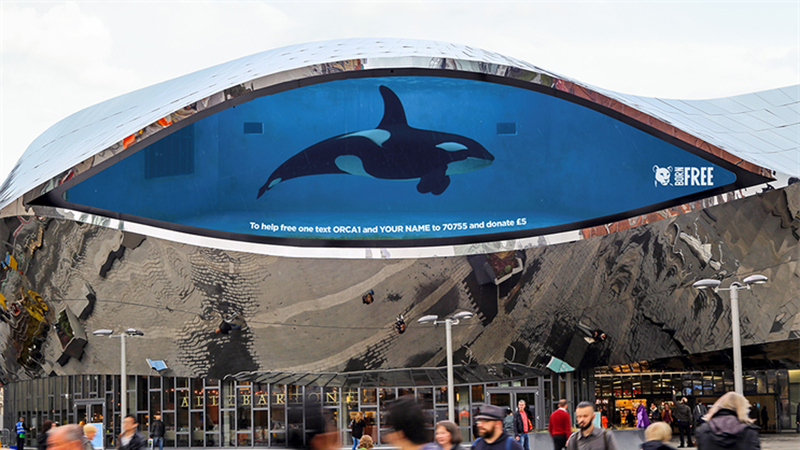 Working closely with WCRS and the Born Free Foundation, The Mill helped to create this large-scale interactive campaign featuring a series of 100% CG orca whales to raise awareness on World Orca Day, displayed on public screens across major cities in the UK. The project launch sees communal screens in London, Birmingham, Liverpool, Manchester and Glasgow transformed into virtual tanks with a large photo-real CG orca trapped inside. The aim of the project is to encourage supporters to help free captive orcas by texting a donation to Born Free. The Mill’s VFX team worked to create a highly authentic representation of this awesome creature, perfecting every detail of the orca’s appearance and behaviour. The team also worked to create the CG water environment in which the orcas are depicted, working with the in-house team at WCRS to ensure the representation remains life-like throughout the installation. Each £5 donation received causes a captive orca to jump out of the screen and swim through other nearby sites to freedom. Its escape triggers the arrival of another captive orca, which swims into the virtual tank, triggering further donations. The clever concept created by WCRS won the annual Ocean Outdoor’s digital creative competition, #TankFree. Mill Joint Head of 3D, Michael Chapman explains, ‘Having worked closely with WCRS on various projects before, we were all really excited to get involved in this task. Our CG team crafted and animated the Orcas to bring across their scale and worked on the environment to show how confined they can be in captivity, and to also convey the space they have in the open ocean.